Definition at line 850 of file matcher.h. Definition at line 853 of file matcher.h. Definition at line 852 of file matcher.h. Definition at line 854 of file matcher.h. Definition at line 855 of file matcher.h. Definition at line 856 of file matcher.h. Definition at line 859 of file matcher.h. Definition at line 888 of file matcher.h. Definition at line 895 of file matcher.h. Definition at line 904 of file matcher.h. Definition at line 935 of file matcher.h. 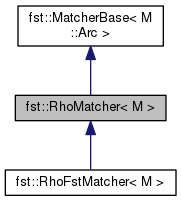 Reimplemented from fst::MatcherBase< M::Arc >. Definition at line 956 of file matcher.h. Definition at line 917 of file matcher.h. Definition at line 973 of file matcher.h. Definition at line 969 of file matcher.h. Definition at line 954 of file matcher.h. Definition at line 958 of file matcher.h. Definition at line 995 of file matcher.h. Definition at line 980 of file matcher.h. Definition at line 910 of file matcher.h. Definition at line 908 of file matcher.h. Definition at line 937 of file matcher.h.